Are you looking for an easy way to make your garden stand out or just a low maintenance ground covering then rocks, pebbles and stones?. Here are some low maintenance landscaping with rocks ideas. 2. Edging a garden bed with large and medium river rocks adds a pretty contrast to your yard and creates a neat edge to your garden beds. 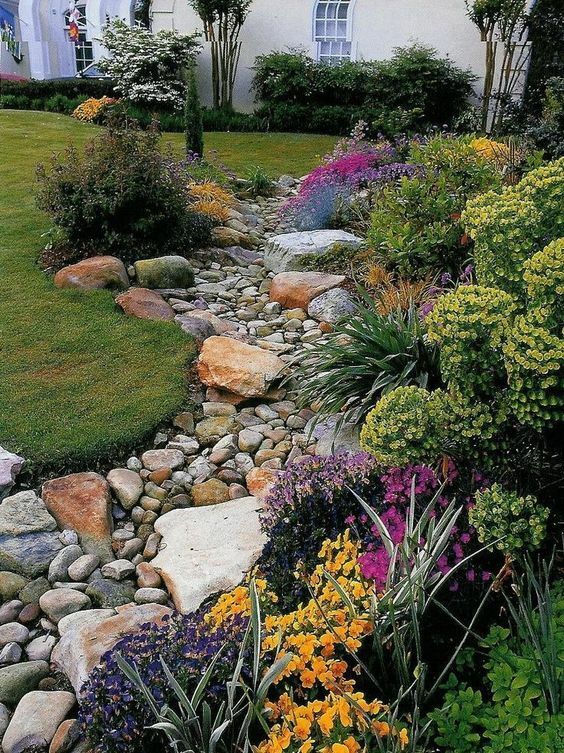 A lovely low maintenance landscaping with rocks ideas. 3. I absolutely love how this low maintenance landscaping with rocks and dry river bed seems to meander so naturally though the forest. With the temperatures rising almost as fast as the water bill, using small rocks like these is a great way to xeriscape your gardens. The rocks let the water find its way down to the soil, keeping the plant roots wet. At the same time, they keep the sun’s UV rays out so that the water does not evaporate. 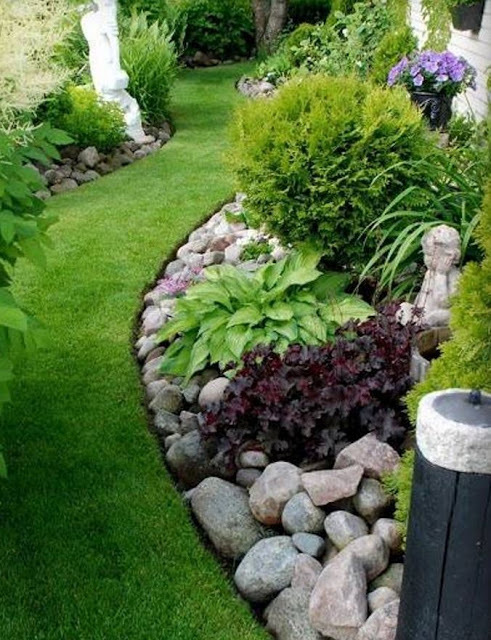 Using rocks to create a border between your house and the lawn serves more than one purpose. The rocks help splatter rainwater away from the wall. They also help to keep the grass far away from the walls which should make mowing the lawn easier. Moreover, they create a beautiful space you can use to plant shrubs and flower. My favorite low maintenance landscaping with rocks. There a several ways you can put a border around your flower gardens and along the footpaths. Building short walls from rocks that have been stacked together to create a sturdy wall is not only very practical, but is also very pleasant to look at. This image is evocative of a small lake or section of swamp made from gravel. The combination of larger rocks and short shrubs help to complete the illusion and of course the heron doesn’t hurt. You could use a variety of animals and plants to create your own miniature world. This rock firepit and seats looks like it would be just at home in Fred Flintstone’s backyard as it does here. Who wouldn’t love to sit out here with a long stick, some marshmallows (or a slab of dinosaur) with the family? What a great way to make use of that “one” corner in your backyard. This homeowner used rocks to create a barrier between the fence and his paver pathway. But more importantly, he used larger rocks to build the retaining wall that allowed him to have a level lawn that is easy to mow. When you have a sloping backyard, the best way to deal with it is to use huge flat rocks like these to build walls to hold the soil back. These flat rocks make a solid wall when they are stacked in this manner without the need for cement or mortar. This homeowner took a simple approach to adding decorations to his gardens. In fact, using large boulders is a good way to break up large sections of garden space like those in this yard. Be sure to scatter them around like this and add a few in the larger open areas. Placing rocks strategically along the slope of the garden with plants scattered among them gives this garden an almost “art deco” look. The other benefit to using rocks like this, is they help hold the soil in place when it rains. With such a slope, the rock walls help keep the soil intact and give the homeowner plenty of room for flower gardens. The small pink and white rock area in front could be a driveway or nothing more than a barrier between the yard and street. If you are lucky enough to live near a forest, a river, the mountains, or just about anywhere you can find rocks of this size, you can literally harvest your own border. You can do it all at once or slowly over time by picking up rocks from different areas for added variety. One way in which water can intrude into your basement is from the water pouring out of the downspout and down into the ground on the outside of the basement wall. These stacked slabs turn the downspout into a beautiful waterfall that directs the water away from the house and into a gravel reception bed. There are certain parts of some yards where grass simply won’t grow, such as around trees. While it might grow while this tree is small creating a rock garden like this one offers a beautiful alternative and gives you somewhere to plant a few of your favorite shrubs. Chances are good, the last time you saw a rock bench like this was in Barney Rubble’s house. Rock is the perfect medium for outdoor furniture that will last virtually forever and only look better with age. (I love the way the owner added throw pillows for a little extra comfort. Take a look at the amazing stairway this homeowner built from large slabs of rock. He even gave them a solid rock wall to keep the soil underneath from eroding. Remember rocks can become slippery when wet so choose your rocks carefully. This homeowner created a low maintenance landscaping with rocks between the sidewalk and the lawn. Using rocks like this along with mulch helps to keep weeds from growing and significantly reduces the amount of water needed to keep the plants alive. You can use small rocks like these to create stepping stones throughout your lawn or your gardens. You can cement them in place or leave them loose so you can move them if you need to. The fun part is creating your own unique pathways running all over the yard. Take a good look at how this homeowner used rocks running through the center of his garden to break up the mulch and give his garden a very unique look. The red shrubs add a stunning touch of color to a very neutral color palette. While the pavers and plastic border piece are an excellent way to create this lovely garden, this homeowner went one step further. Adding the border of white rocks along with the pink pavers creates a remarkable image. Did you enjoy the low maintenance landscaping with rocks ideas post? Share it on facebook and pinterest.